Walter Perry Johnson (November 6, 1887 – December 10, 1946) was an American Major League Baseball pitcher. He played 21 years in the Major Leagues, all for the Washington Senators. He was then the manager of the Senators from 1929 to 1932, and he managed the Cleveland Indians from 1933 to 1935. He was known for being able to throw baseballs with great speed, and he was nicknamed "The Big Train". He set many baseball records and has the second-most wins of all-time. Many people think he is the greatest pitcher of all-time. 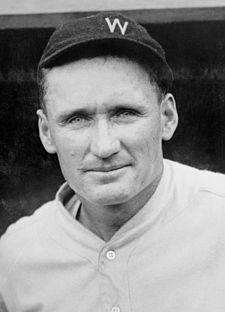 Walter Johnson was born on November 6, 1887 on a farm near Humboldt, Kansas. His parents were Frank and Minnie Johnson, and he had five siblings. When Johnson was 14, his family moved to Orange County, California. Later, he moved to Idaho, where he played baseball for a small team from Idaho and worked for a phone company. When someone from the Washington Senators saw him pitch, they signed him to a contract in 1907. Walter Johnson was known for being a "power pitcher," meaning he could throw the ball very hard and fast. His fastball was the main reason he was able to accomplish so much, like having the most 3,509 career strikeouts and the most shutouts of all-time. He also won the American League Most Valuable Player award twice, in 1913 and 1924. After he retired from playing in 1927, Johnson was one of the first five players elected to the Baseball Hall of Fame in 1936. He later ran for a spot in the United States House of Representatives, but lost the election. He died from a brain tumor in Washington, D.C. on December 10, 1946. ↑ Studeman, Dave. "The Best Pitchers of All Time". Hardballtimes.com. Retrieved 5 February 2012. ↑ Kalb, Elliott (2005). Who's Better, Who's Best in Baseball?. McGraw-Hill Professional. p. 45. ISBN 0071445382.